Smith & Wesson Distressed American Made Flag 100% Cotton Short Sleeve Tee Shirt. Double-needle stitched neckline, bottom hem and sleeves, seamless collar, and shoulder-to-shoulder taping with pocket on left chest. Imported shirt, decorated in USA. Graphic Description: Distressed American made flag logo print on back with small S&W logo on front left chest. That is an officially licensed product of Smith & Wesson and is used with S&W Corp.’s permission. Smith & Wesson apparel is iconic in the USA. Smith & Wesson M&P is a line that was once developed with Military and Police professionals in mind. Since 2005, M&P is used by nearly 300 US police departments. S&W apparel is meant to be worn by gun collectors and precision shooters who know the most efficient hand guns and rifles are Smith & Wesson. This is a traditional brand that combines old-time craftsmanship with brand new technology. Whether you carry a gun to proclaim your 2nd amendment right, keep it at home for protection or go shooting to your past time, our officially licensed Smith & Wesson apparel represents it all. Officially licensed Smith & Wesson apparel makes a great gift. 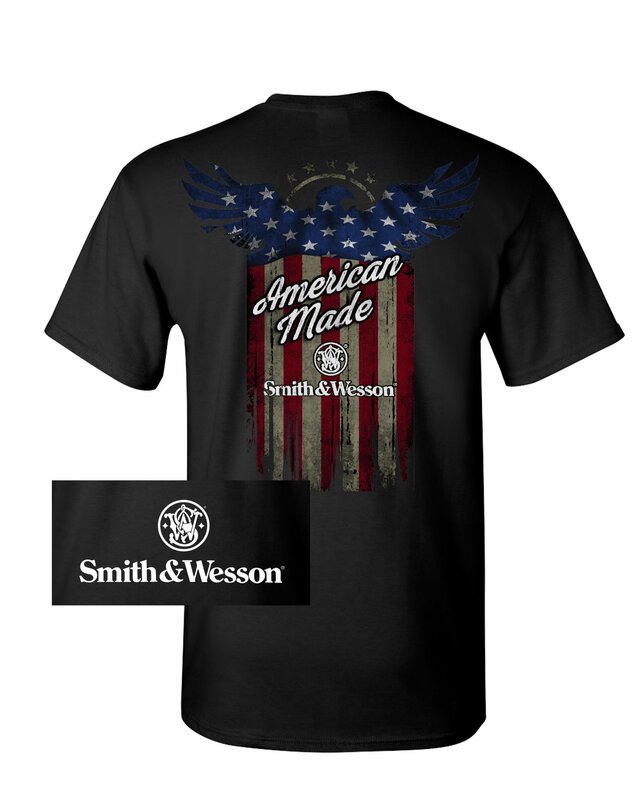 Smith & Wesson apparel lets everyone know you like your guns and live to offer protection to your 2nd amendment rights.